The first week of the 2016-17 television season is in the books, and it's been a mixed bag for the broadcast networks so far. While a few shows had big launches—This Is Us, which Tuesday night became the first freshman series to be picked up for a full season, and Designated Survivor are shaping up to be the freshman hits buyers were hoping they would be—there's already one out-and-out disaster, and two networks already seem to be in free fall. For the first three days of the season, every new show rated at least a 2.0 in the all-important 18-49 demo. That's because the networks gave those series the very best chance to succeed, airing them either before or after their biggest shows like NBC's The Voice (which launched both The Good Place to a 2.3 rating and This Is Us to a 2.8, highest of all new shows, which prompted NBC's quick order for an full, 18-episode season); CBS' NCIS (Bull, 2.2) and The Big Bang Theory (Kevin Can Wait, 2.6); ABC's Modern Family (Speechless, 2.0) and Black-ish (Designated Survivor 2.2); and Fox's Empire (Lethal Weapon, 2.2). "We're back to protected time slots," said Sam Armando, lead investment director at Mediavest | Spark. "The network made it a point for the shows they're high on to really protect it with something." That success validates the point broadcast schedulers made in our April feature—that even as viewing habits shift, the best way to get a new show sampled is to put it before or after a current hit. Scheduling is more important than ever. And when live-plus-3 ratings were factored in, This is Us and Designated Survivor pulled away from the freshman pack. This Is Us had a 1.4 bump (more than some new shows managed in live-plus-same day), jumping up to 4.2, and Designated Survivor added 1.5 to end up at 3.7. Shows without big lead-ins, meanwhile, withered on the vine. Fox's superb Pitch came in at a 1.1, which still managed to improve on its anemic Rosewood lead-in (0.7). And The Exorcist could only scare up a 1.0 on Friday. One glaring exception to the week's scheduling success was ABC's drama Notorious, which was given the cushy Scandal time slot (that show is delayed until January to accommodate Kerry Washington's pregnancy), sandwiched between Grey's Anatomy and How to Get Away With Murder. But the TGIT audience, used to watching Shonda Rhimes-produced shows then, completely rejected Notorious, which didn't come from Rhimes and also happens to be one of fall's worst new shows. Notorious shed 56 percent of its Grey's lead-in, dropping from a 2.5 to a 1.1, which is just one-third of what Scandal did there last fall. It also brought down How to Get Away With Murder, which could only manage a 1.4 (even with its finale, but down almost 50 percent from its 2.6 last fall). That abysmal performance should trigger fall's first schedule change, as ABC will need to stop the hemorrhaging by shifting Notorious to another night if not cancelling it outright. Earlier this month, I wrote of CBS' new shows: "I can't remember another freshman fall lineup in which all shows were likely to be so warmly embraced by that network's core audience while being completely rejected by everyone else." And that's what has happened. CBS' doggedly on-brand new shows racked up scathing reviews but drew the CBS audience the network was counting on. Even MacGyver managed a 1.7 rating on Friday, CBS' best demo rating of the night. 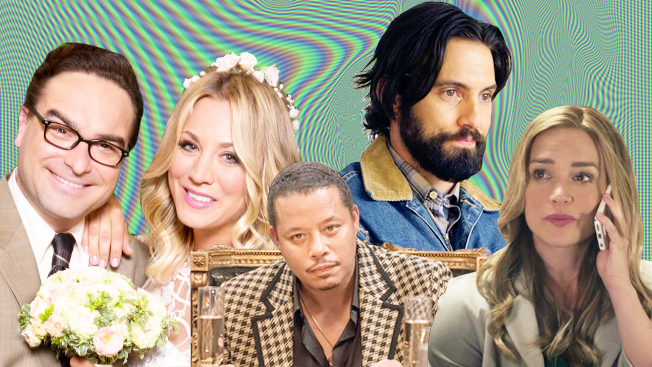 The heads of all the broadcast networks shared their fall TV playbooks earlier this month, but ABC and Fox are going to need some quick rewrites. Both networks hoped to gain ground on NBC and CBS this fall, but they both stumbled out of the gate, with double-digit demo drops versus the first week of the 2015-16 season. ABC averaged just a 1.3, down 24 percent from last fall, and Fox's 1.2 was a 25 percent drop-off. NBC and CBS tied at 2.5, but NBC was down 7 percent from last fall. CBS was flat, which is the new up in the linear world. But NBC does have a silver lining—it has five Thursday Night Football games coming later in the fall. A big reason for ABC and Fox's double-digit declines this season is that audiences aren't just ignoring one or two shows—they seem to have abandoned entire nights of programming altogether. Fox averaged just a 1.1 for its Tuesday lineup of New Girl, Brooklyn Nine-Nine and Scream Queens, while Thursday night averaged 0.9 thanks to Rosewood. ABC's Sunday audience has also gone up in smoke. Once Upon a Time could only muster a 1.3, and Secrets & Lies returned to a 1.0. Last year's hit Quantico, meanwhile, opened with a hefty 1.9 last fall; Season 2 lost almost half that audience, coming in at just a 1.0 (though that show usually has a big delayed-viewing jump). Football and NFL preshows accounted for five of the top 10 shows among 18- to 49-year-olds last week, but even the mighty NFL is coming back down to earth slightly this fall. Thursday Night Football actually improved on last year (up to a 6.1 from 6.0) after a drop the previous week, but Sunday Night Football continues to underdeliver. Sunday's game rated a 7.6, which was off 6 percent from the same week last fall (8.1). And The Big Bang Theory, entering its 10th season (and the last for which its cast is under contract) also has a lost a few steps. It's still the top comedy in the demo, but its 3.8 rating is down 20 percent from last fall (4.7). Empire remains the No. 1 broadcast drama in the demo, but it's not the beast it was a year ago. It tied for fourth among 18- to 49-year-olds with a 4.2, an improvement on its Season 2 finale (4.1), but down 38 percent from its Season 2 premiere. The Voice was also off from its fall 2015 debut, but only slightly, with 3.3 on Monday and 3.4 for Tuesday's broadcast, compared to 3.5 for both nights last fall.